From the bacteria to the vertebrates, a large amount of species have been utilized. Nevertheless, it is among the plants where valuable indicators have been found. More often, plant assemblages are the most useful in informing about the general conditions of an environment, from its past to its future. The phytosociological approach is demonstrative. 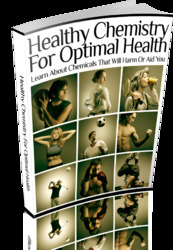 Invertebrates, nematodes, oligochaete worms, and insects are among the most frequently used. Birds also merit a special attention, but they could give their most useful indications at higher levels of ecosystems. The use of organisms to judge the state of continental aquatic ecosystems is as old as a century ('Saprobies' method). This method evolved till present, with substantial modifications. It is no longer used to only detect the level of organic pollution in streams and lakes. Macrobenthic invertebrates (oligochaetes, mollusks, and arthropods) are the most favorite indicator species. Innumerable researches have demonstrated the effects of pollution and other disturbances on the modifications of the faunal structure of communities and have proposed numerous diagnostic methods. Zoological groups are classified according to their sensibility (or their resistance) to pollutants and the influence of the morphology and dynamics of the environment on the community at the sampling point. Presence of Plecopteres and Trichopteres is considered as an indicator of 'good' environments, whereas Tubificidae and Chirominae are indicative of 'bad' environments. The seas represent 75% of the Earth's surface, which is one of the reasons why the approach of biological indicators in marine environment is preferable here. This choice is based on the diversity at the higher levels of marine animals, their exclusive presence for there are numerous of them; the great diversity of habitats; and the fact that, ultimately, all pollutants join the sea. 4. a 'normal zone', consistent with the 'unaffected' communities encountered in the corresponding geographical zone. These zones and subzones are clearly related with amounts of pollutants, especially organic matter and levels of physical variables in the sediment. Such a schema is recognized throughout the European and Mediterranean seas. It is also in perfect concordance with similar studies along the Californian coast. 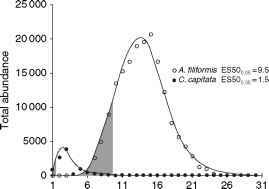 Figure 2 Examples of total abundance frequency distributions of the pioneer colonizer Capitella capitata and the frequently occurring Amphiura filiformis in relation to their ES50 values. The most tolerant individuals are associated with the lowest ES50 values. This gives the tolerance value: ES500 05. Shaded portion represents 5% abundance in relation to lowest ES50 values. Modified from Rosenberg R, Blomqvist M, Nilsson HC, Cederwall H, and Dimming A (2004) Marine quality assessment by use of benthic species-abundance distributions: A proposed new protocol within the European Union Water Framework Directive. Marine Pollution Bulletin, with permission from Elsevier. been proposed according the Hurlbert's formula and recently reassessed. Figure 2 presents an example to show the abundance distribution patterns of two species, Capitella capitata and Amphiura filiformis, of great relevance in disturbed environments. The selection of these indicators is 'subjective' or 'objective'. To be effective, their use needs an optimum knowledge in systematics and great competence in the ecology and ethology of the chosen species. 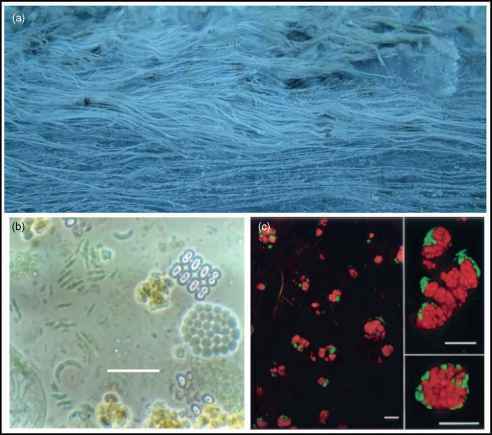 If invertebrates have mostly interested specialists of marine pollution, it is well recognized that the phyto-benthos could be very sensitive (or not) to polluted waters. If Phaeophyta are rather sensitive (based on the correlation of the disappearance of Cystoseira amentacea stricta along a gradient of detergents in Marseilles area), Chlorophyta could be rather tolerant and Rhodophyta could have diverse requirements.